Why have we placed such a high value on sense-making over meaning-making? Sense-making involves understanding and demonstrating a content or skill. Much of the work we do in school is related to sense-making and there is nothing inherently wrong with this. We need to know facts and learn skills. But why don't we make greater efforts to connect sense-making with things that bring meaning? Meaning is what helps us to really make sense of the world. It's coming to a place where we understand why our sense-making matters. Meaning gives relevance to our learning. Daniel Pink explains in his book Drive that people are more effective, more motivated, and more connected to the work, and all areas of life, when conditions exist that allow for autonomy, mastery, and purpose. When we have autonomy we feel we have a voice and a choice. When we are able to do things well (mastery), it makes us want to try even harder and do even more. And when we have a sense of purpose, we feel our contributions matter and that what we contribute is bigger than ourselves. These conditions are far more powerful than extrinsic rewards, because deep down we know that things that are most meaningful are ones that stand the test of time. Extrinsic rewards satisfy for a moment, but they don't deeply satisfy. They only feed appetites for more recognition, more rewards, or more pleasures. We need meaning, not more stuff, not better grades, not more rules or policies. In our hurried, success-driven, hyper-connected culture, there is a hunger for meaning in ways like never before. We need something greater than ourselves and our shallow appetites (more stuff, more fame, more instant gratification). So how does this all translate to the classroom? Let's ask students to do stuff that really matters, to themselves and to others. Learning shouldn't happen in isolation from real impact. 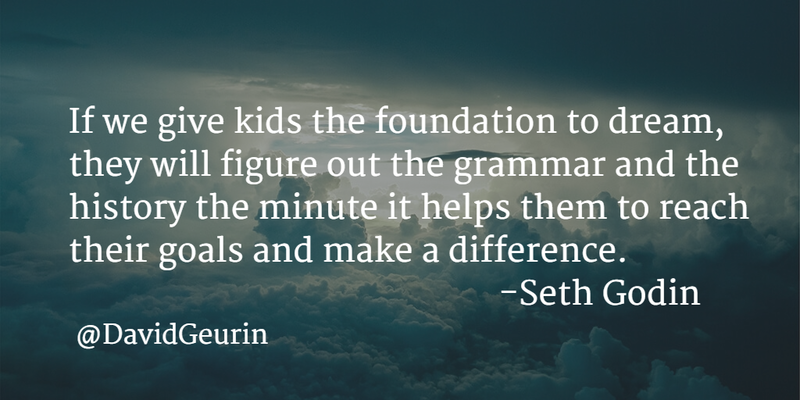 Open the world and find ways for students to make a difference now. Give students the freedom and flexibility to do something amazing. As I think about the learning experiences from my school days that I remember the most, they are ones that were personally meaningful to me. We can't expect sense-making to last beyond the test if we don't help students have personal meaning connected to the learning. Make learning personally meaningful and students will find their passions and become self-determined, lifelong learners. Tech Geek or Teaching Geek?